Charlotte, Sasha Banks, and Becky Lynch steal the show at Wrestlemania. Charlotte begins a program with Natalya on Raw. A Women’s Title Match stole the show at Wrestlemania. A Wrestlemania that featured a Hell in a Cell Match, a multi-man ladder match, Brock Lesnar, and AJ Styles, was topped by a Women’s Title Match. How amazing is that? Mind you, this is subjective. 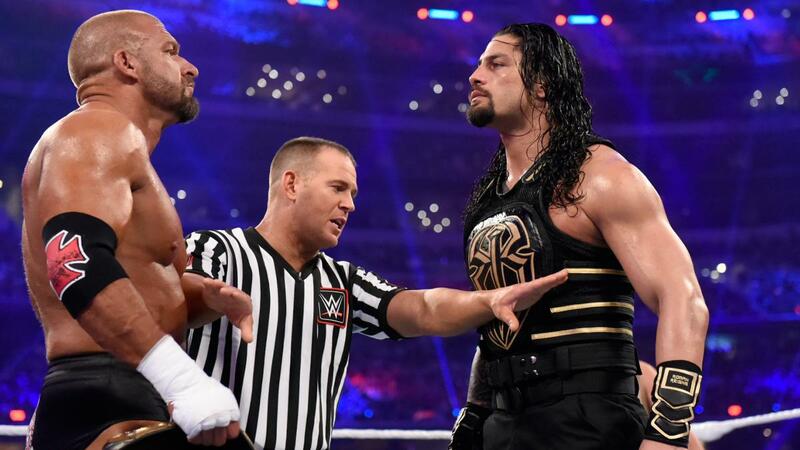 But in terms of suspense and engagement, this match beat everything else at Wrestlemania. I couldn’t be more proud of Charlotte, Sasha, and Becky. Today’s WWE announcers aren’t very credible. But what JBL is saying about this being a great era for women’s wrestling is definitely valid. What’s more, Natalya is being added to the mix. I’m absolutely thrilled. And let us continue to rejoice that the Women’s Title is back, and the Divas Title is dead. That butterfly belt was one of the gaudiest looking titles I’ve ever seen. Thank God we never have to see Sasha, Becky, Bayley, or Asuka wear that awful thing. Seeing Lita unveil that new belt on the Wrestlemania pre-show was a really cool moment. Having her their was very fitting. Roman Reigns received with thunderous boos as he wins the WWE Heavyweight Championship at Wrestlemania, and appears on Raw. I’m not sure what else can be said at this point about Reigns’ popularity, or lack thereof, with the fans. He and Triple H got booed mercilessly at Wrestlemania, and he was booed mercilessly on Raw. Our top babyface, ladies and gentlemen. AJ Styles wins the right to challenge Roman Reigns for the WWE Championship by defeating Chris Jericho, Kevin Owens, and the returning Cesaro. First and foremost, AJ Styles and Chris Jericho were awesome at Wrestlemania. Not quite as good as the Women’s Title Match in my view. But still great. Styles’ loss caught a lot of fans by surprise, but obviously he made up for it here. Cesaro has to make up for lost time, but he looks like he hasn’t lost a step. I’m curious if that suit is now a part of his entrance. That Jason Statham look definitely suits him. While it remains to be seen when Styles will challenge for the title. But the theory is because this is a babyface vs. babyface match, Reigns could turn heel and enlist the help of the Bullet Club, a.k.a. Karl Anderson and Doc Gallows. Again, I’ll believe it when I see it. Kevin Owens attacks Sami Zayn, keeping him out of fatal fourway main event. Now that there’s no Intercontinental Title at stake, it’s now WWE’s responsibility to tell us why these two men don’t like each other. The Undertaker def. Shane McMahon at Wrestlemania, in a Hell in a Cell Match that saw Shane jump from the top of the cage. I take no joy in saying this, but this match was a snooze fest. From an execution standpoint, it had a lot working against it, not the least of which was that Shane hadn’t wrestled in so long. Plus, you had two big babyfaces in there, which seemed to leave the crowd unclear on who to cheer for. People definitely loved Shane. But who wants to root against The Undertaker? Then you have that dive Shane took off the cell. I love Shane for being willing to take that risk. But in truth, this match didn’t deserve a huge bump like that. It was almost a waste. I’m not convinced we’ve seen the last of Shane. In a company that desperately needs marquee talent, Shane is truly over, and truly beloved. There’s as much a place for him there as there’s ever been. The Rock and John Cena beat down The Wyatt Family at Wrestlemania. The Rock pins Erick Rowan in a six second match. This stuff with The Rock needlessly ate up so much time. I’m not sure why they felt the need to have Rock pin Rowan in all of six seconds, when they could gone right to the beat-down we all knew was coming anyway. Still, it was cool to see Rock spar with Bray on the mic a bit. And yes, it was nice to see John Cena. Given some of the reactions Roman Reigns has been getting, Cena’s reactions look like Hogan’s in the ’80s. Zack Ryder wins Intercontinental Championship at Wrestlemania, loses title to The Miz (with his wife Maryse) on Raw. To say the least, Ryder’s Wrestlemania win was a shock. But he deserved it. The poor guy has been messed around with by WWE so much over the years, and we know how much WWE loves a good underdog story. That being said, it wasn’t surprising to see them take the belt off him the very next night. Ryder was only put in that match as a replacement for the injured Neville. He hadn’t even been on Raw regularly. I’m a Zack Ryder fan. I even bought on of his Broski t-shirts when he was hot a few years ago. But the writing was on the wall. I’m intrigued by Maryse’s return alongside her real-life husband, The Miz. He’s called himself a chick magnet in the past. But actually seeing him with someone as gorgeous as Maryse is bound to draw some heat. I’m down for that. The League of Nations def. The New Day at Wrestlemania, but after failing to win the tag titles on Raw, Wade Barrett is ousted from the group. 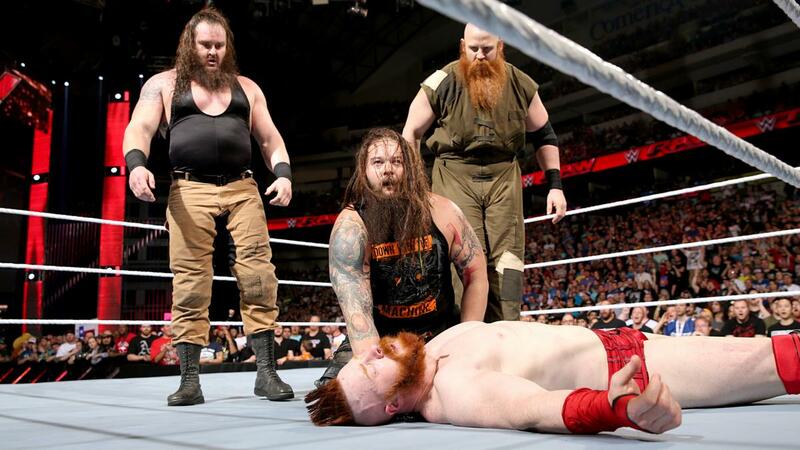 The remaining members are then attacked by The Wyatt Family. As it’s been all but confirmed that Barrett is leaving the company when his contract expires in June, this may have been his last appearance on Raw. It’s truly sad that he was never truly able to live up to the potential he had when he made the main roster in 2010. Yes, he was injury prone. But it wasn’t strictly his fault. He was also the victim of some bad booking decisions in 2010, most notably The Nexus’ loss at Summerslam that year. Still, he had a run with the biggest wrestling company in the world, and was able to main event some pay per views with John Cena. That’s something nobody can take away from him. I can only assume this attack by The Wyatt Family means they’re finally turning babyface. Bray is ready, and has been ready for quite some time. However, one thing that was painfully apparent at both Wrestlemania and Raw was how sorely the group misses Luke Harper. Neither Erick Rowan or Braun Strowman have that much credibility on their own, especially after Rowan lost to The Rock in six seconds at Wrestlemania. It’ll be interesting how the dynamic of this group shifts if this is a turn. Baron Corbin loses to Austin Aries at NXT Takeover: Dallas, wins the Andre the Giant Memorial Battle Royal at Wrestlemania, beats down Dolph Ziggler on Raw. Definitely a big week for Baron Corbin. His victory at Wrestlemania was a welcome surprise. From a match perspective, I can’t say I was enamored with what I saw from him. He also looked like he had some butterflies during his promo on Raw. I can’t say I blame him. But he’ll be in good hands going forward, as it looks like he’ll be spending time with Dolph Ziggler. The Dudley Boyz and The Usos trade wins at Wrestlemania and Raw. 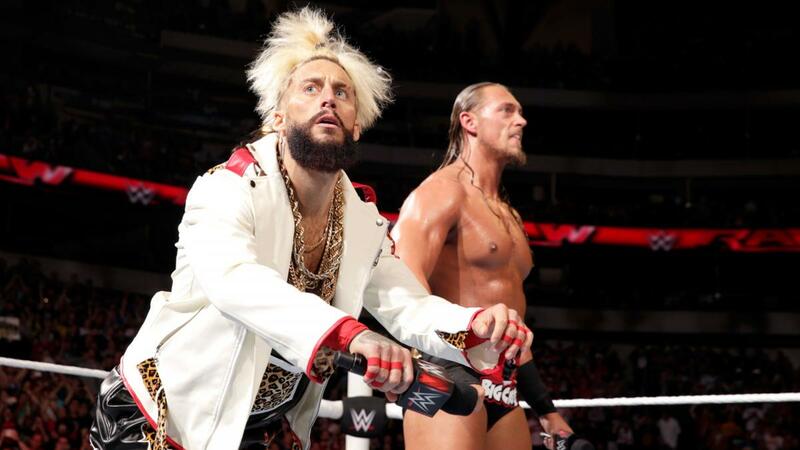 Enzo Amore and Colin Cassaday debut after the Raw match. It looks like the Dudleys are getting new dance partners in Enzo & Cass. That’s an awesome pairing in my book. But I’d be open to one more match between the Dudleys and the Usos on Raw. It’d be the perfect chance for our newcomers to interfere and cost them a win. This was a hell of a start for Enzo & Cass, and overdue in the eyes of many. These guys certainly have no shortage of catchphrases. I’m curious to see how well the crowd knows them next week, as we lose a lot of that post-Wrestlemania glow. Apollo Crews def. Tyler Breeze in his Raw debut. I haven’t seen as much of Apollo Crews as I have other NXT wrestlers. But I was very impressed with what I saw in this short match. He gave a lot of credence to what the announcers were saying about his versatility. It’s not often you see someone who has both that strength, agility, and explosive leaping ability. I only wish he hadn’t knocked of Tyler Breeze. He’s been there such a short time, and already he’s being used as enhancement talent. Not that there’s anything wrong with that, but damn. This entry was posted in Wrestling and tagged AJ Styles, Apollo Crews, Austin Aries, Baron Corbin, Becky Lynch, Big Cass, Bray Wyatt, Bullet Club, Cesaro, Charlotte Flair, Chris Jericho, Dolph Ziggler, Enzo & Cass, Enzo Amore, Erick Rowan, Hell in a Cell, John Cena, Kevin Owens, League of Nations (WWE), Lita, Luke Harper, Maryse Oullet, Natalya (WWE), NXT, pro wrestling, professional wrestling, Roman Reigns, Sami Zayn, Sasha Banks, Shane McMahon, Shane McMahon vs. The Undertaker, The Dudley Boyz, The Miz, The New Day, The Rock, The Rock Wrestlemania, The Undertaker, The Usos, The Wyatt Family, Tyler Breeze, Wade Barrett, Wrestlemania, Wrestlemania 32, Wrestlemania XXXII, WWE, WWE Monday Night Raw, WWE Women's Title, Zack Ryder on 04/07/2016 by primaryignition.